Stamping with Loll: Happy 90th Birthday Mom! Hi everyone. Today is my mother's 90th Birthday. Hubby and I will be heading over to her place this afternoon and will have dinner with her and some of our family. I organized a small gathering at her house for family last Sunday. It turned out really nice and everyone had a good time. I hope to share some pictures soon. For the card, I started by using a lovely leafy stencil given to me by my friend Julia. I'm embarrassed to say that I've had it for AGES and not used it. It worked perfectly for my card, using it twice to apply coloured embossing paste. I added green and a little blue ink to my mat, scooped some white embossing paste over top and mixed it just a bit to get some graduation of colours. I added a layer of paste through the stencil, let it dry and then added another to create the background for my card. The flowers are stamped in black, watercoloured with distress inks and then die-cut with a matching die. This sure saved a lot of fussy-cutting! To finish, I added a simple sentiment of white heat embossing on black card stock. I had fun watercolouring these sweet flowers. This is a new-to-me stamp and die set. 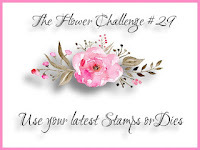 I'm going to share this card over at The Flower Challenge. 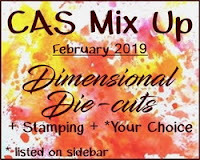 Also adding this to the CAS Mix Up February challenge - Dimensional Die-cuts. ... and adding to Take-It-Make-It Challenge at Craft Stamper Magazine. Gorgeous card, Loll, I love how you coloured the flowers. I'm sure your mum will be delighted. Have a great time! Such a pretty card Loll. what a pretty card for your mom - she'll love it i'm sure. must check out that flower and die set! What a pretty card! So springy! A very happy birthday to your mom! Congrats to your Mum, I suspect she LOVED her card, it's beautiful. I love the citrus colors on this wonderful card for your Mom. The matching embossing paste background is such a perfect backdrop for your beautifully colored flowers. Your card is so cheerful Loll. Happy 90th to your mom too! A very happy birthday to your mama. Really sweet card!!! Happy 90th Loll's Mom!!! A beautiful card to celebrate a special birthday! Enjoy your time together in celebration! Love the colored embossing paste. I've yet to try that. The flowers are so bright and pretty! Many, many bruggt summery happies to your darling mum from Oz! Neither my darling mum or dad made it to 90 but very very blessed to have them as long as I did. Some do not. Love card.. must do the ink colouring paste again it is so much fun and looks really great Loll love the stamp and stencil. Well done! Love your new stencil - it made a perfect background in that beautiful soft green. And what a gorgeous spray of flowers and leaves for the focal image. I hope your mum has a wonderful afternoon and evening with you. Happy birthday to your mom, Loll! What a pretty embossing paste leaves! The layered die-cut flowers are beautifully watercolored. Love the the cheerful floral dimension and the graduation of the leaves. Hope you and your family have a wonderful dinner time together tonight! WOW! Happy 90th Birthday to your darling mum .... hope you had a lovely party. What a fresh and pretty card. Love how you did the background with the stencil and paste, which adds a wonderful texture to your beautify card x.
I hope you had a lovely celebration with your mom. I'm sure she loves this card. It's a beauty. I like the texture of the leaves and the pretty watercoloring. You are so talented and I love all the ways you add interest to your cards, Loll! Such a pretty card. 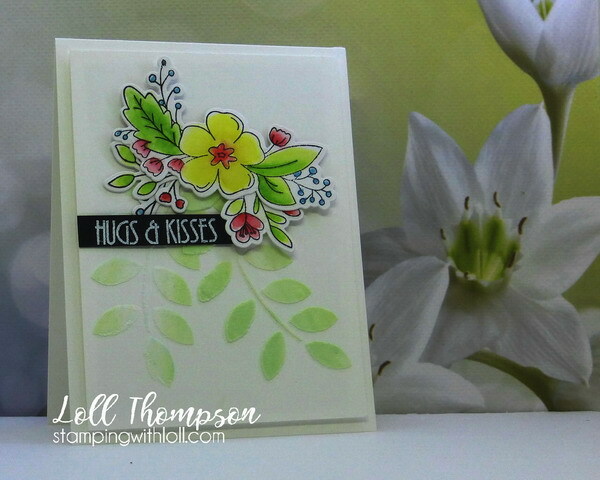 Love the soft, spring colours and the embossing paste looks amazing. That definitely has to go on my 'to buy' list. What a wonderful card for your mom. The embossed leaves in green paste are so pretty and adds interest to the flowers. Your water color is always stunning. Sending birthday wishes to your mother on her special day. Belated Happy Birthday wishes to your mom, Loll! God bless her for reaching 90 years...I wish her the best of health and happiness in the coming year! Happy 90th Birthday to you Mom!! Your card is gorgeous with the lovely flowers! 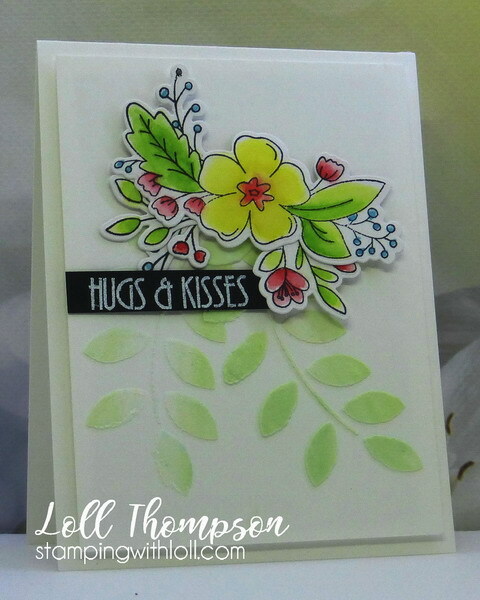 And, the light green embossing paste using a leaf stencil is so eye catching! I’m sure your Mom truly appreciated the stunning card!! Best Birthday Wishes to your 90 year old Mum! Love the bright and cheerie colours Loll with the coloured embossing paste. Beautiful bouquet, Loll, and perfect colors. Congrats/Happy Birthday to your mom, what a feat! Happy Birthday to your Mom, Loll. This is such a lovely bouquet and the embossing paste leaves add soft color and texture. Thanks for sharing your card with us at The Flower Challenge. Such fun to hear that your Mom is such a party animal ;) Happy 90th to her - bet she's a lovely woman to have raised a daughter like you. And I'm struck by your non-Loll color choices for this one! So very fun and springy. Beautiful card and I love the yellow with the green and pop of red. Love how you used the stencil as well. So pretty! Thanks for playing along with us at The Flower Challenge. Love the ombré effect of the embossing paste. Great dimension too.